Planning a wedding requires you to carefully consider each and every detail since this will be one of the most important and memorable events in your life. From finding the perfect venue and organizing wedding transportation in San Diego to choosing a decor color scheme and finding the perfect bride and groom attires, there are plenty of things to do. When it comes to transportation, there are many reasons why you should hire a wedding transportation service. Of course, this brings a few additional considerations, such as when to book the transportation service, how to include the instructions on the invitations and the overall price of wedding transportation. Should you provide transportation for wedding guests? Whether you’re planning a big wedding or a small one just for the closest friends and family members, hiring a transportation service can bring both you and your guests a great number of benefits. Booking with a transportation service means that you won’t have to worry about some of your guest arriving in the middle of your wedding ceremony. You know that you need to plan your schedule carefully, so the last thing you need is unnecessary delays. If you book wedding transportation for your guests, you can count on them to arrive in a timely manner because such a service brings a high level of punctuality. This will help you relieve a lot of pressure and stress and enable you and your soon-to-be spouse to enjoy the pre-wedding excitement. However, even if your wedding happens to be running a bit late, a reliable and trusted transportation service will help you get through this by accommodating some last-minute pick-up changes. You don’t want your guests to have to race to get a great parking spot. Instead, you can just send an elegant shuttle to pick them up and take them to your wedding venue. This will also allow your guests to relax and enjoy your special day to the fullest instead of stressing about parking spots. There are plenty of charming venues that you can consider for your wedding, from romantic Ocean Beach to a charming, intimate restaurant. If you still don’t have any specific wedding ideas, you can always browse the Wedding International Professionals Association blog for inspiration and advice. However, some of your guests might not know how to find the location you choose, especially if some of your friends or relatives are from another state. If you book a wedding transportation service, you won’t have to worry about your guests getting lost in San Diego. Both you and your guests will be completely stressed if they get lost somewhere in the city. You can easily avoid this by simply organizing a shuttle to pick them up. They will get a reliable and knowledgeable driver who has vast knowledge about the area and who can easily get around. If you want to make your day truly special to both you and your guests, hiring a wedding transportation is definitely the way to go. You will make a wonderful impression on your guests, make your wedding day more luxurious and elegant and ensure that everyone remembers it. What’s more, this will also send your guests a message that you want them to feel comfortable, as well. They will greatly appreciate the convenience and comfort that wedding transportation brings. Also, a reputable transportation company works with highly professional and polite drivers who will truly delight your guests with their reliable and friendly service. How do you navigate wedding transportation? One of the greatest benefits that some transportation services offer is communicating with your wedding planner. You don’t have to worry about some of the details because you can simply let your wedding planner handle this wedding arrangement. However, you should still be involved and make a few important decisions. After all, you want to stay up to date with your wedding plans and make sure that your wedding planner and the transportation company have all the information they need to make your wedding day special and memorable. Know the headcount. Of course, knowing how many people will come to your wedding is the best place to start because you’ll know what type of vehicle you need to book. You also need to decide whether you’ll provide transportation to all of your guests or just the bridesmaids and groomsmen. Book on time. Planning the perfect wedding takes time, so it’s always better to start as soon as possible and book a transportation service in advance. This will give you enough time to plan some details, find a reliable company and notify your guests. In addition, you don’t want to risk not being able to find wedding transportation available on your wedding day. Inform the guests. You also need to let your guests know that you’ll be providing organized transportation. The easiest way to do it is to include all the relevant information and instructions on the invitations. You can also ask them to confirm whether they’ll need transportation on your R.S.V.P. cards. Think about yourselves. Finally, remember that this is your wedding day and that you should relax in an indulging atmosphere. You should hire your personal limo and ask the chosen company to include some perks, such as chocolate, roses or champagne. How much should I spend on wedding transportation? This decision will greatly depend on your overall budget for your wedding. The average cost of wedding transportation is $750, with most couples spending between $500 to $1,100. 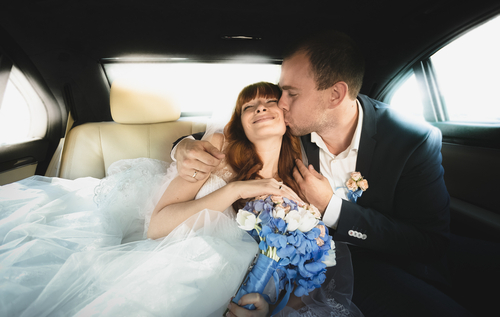 Of course, the total cost for your wedding day transportation may greatly differ depending on whether you choose to provide all of your guests with transportation or just your immediate friends and family. It’s always better to allocate a slightly greater amount just in case. You always want to have an emergency fund for unpredictable situations and unexpected costs. Also, this is your special day, so don’t hesitate to indulge yourself and choose luxe limo for the ultimate wedding day experience. What’s the most exceptional wedding transportation in San Diego? That’s Stay Classy! Stay Classy Transportation can make your special day truly memorable and inspiring by offering elegant San Diego wedding transportation service. We can be there for you and your guests on your wedding day, making this experience truly enjoyable for all of you. Whether you want to include some special amenities or if there are any last-minute changes, we can accommodate your requests and special needs. Just book with us and let our experienced and highly trained chauffeurs take all the stress away from your wedding day. Contact us and have a wedding day of your dreams.